Let guests get creative by creating a hot chocolate bar complete with a variety of mix-ins that everyone can enjoy. 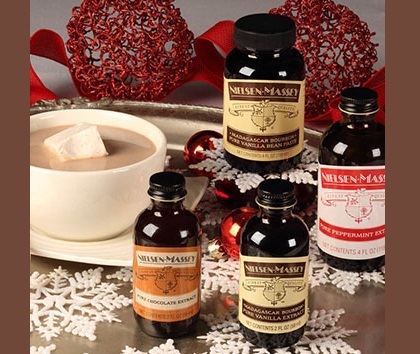 Start with a batch of Gourmet Peppermint Hot Cocoa (recipe below), an enhancement of the classic beverage using three different Nielsen-Massey extracts: Pure Peppermint Extract, Pure Chocolate Extract and Madagascar Bourbon Pure Vanilla Extract. Provide an assortment of finishing touches, such as Vanilla Bean Marshmallows, peppermint stir sticks and spoons dipped in melted white chocolate or milk chocolate chips. In a medium saucepan, combine cocoa powder, sugar and salt. Place over medium-low heat and gradually whisk in milk and half-and-half until combined. Heat to serving temperature, stirring occasionally, do not boil. Stir in pure vanilla, peppermint and chocolate extracts.